It grabs your taste buds and just doesn't let go. Produced in The Midleton distilleries situated in Midleton, Cork County, this is a ‘pure pot still’ Whiskey or ‘single pot still’ as it's now officially known. It is made in a different way than single malt because the mash is made from both malted and un-malted ‘green’ barley. The enzymes in the malted barley stimulate the production of malt in the un-malted barley. Also, single malt Whiskeys are generally distilled twice, whereas single pot still Whiskeys are generally distilled three times. 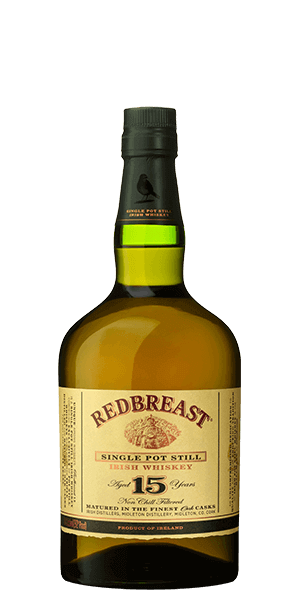 Redbreast is one of the few single pot still Whiskeys produced today and is the only one with an age statement. 15 Year Old is matured in a combination of American Bourbon Whiskey barrels and Spanish Oloroso Sherry casks. What does Redbreast 15 Year Old taste like? The Flavor Spiral™ shows the most common flavors that you'll taste in Redbreast 15 Year Old and gives you a chance to have a taste of it before actually tasting it. Toffee, vanilla, berries, cherries and aromatic oils. Some cinnamon and ginger if you water it down. Oily mouth feel, maple syrup sweetness with more red fruits, spices, toasted wood and rich oak tannins towards the end. Spicy, crisp, and tannic with lingering notes of unsweetened chocolate, oak and malty notes. This is an outstanding tasting whiskey with a smooth buttery finish . Extremely smooth and it went down so easy. I truly enjoyed this whiskey, with or without some ice. Better than the 12 year. Smooth and sweet. very smooth when conpared to the 12 year old version. By far my favorite Irish whisky. A wonderful gift for anyone wanting to up their game a bit. I will never turn down a glass of Redbreast. Had the pleasure of tasting this during a Whiskey Wednesday. This was incredibly delicious. Smooth, full of flavor, and easy to drink. One of my favorites. A bit sweeter, very smooth. Used to partake regularly 30 years ago when it stocked at a local Irish hostelry - top draw. Мощный, напористый, богатый вкус, запах и послевкусие. Очень понравился. Powerful representations of the flavor spiral. Not an easy sip but great aftertaste. Definitely more refined than the 12 year but not so much to make the premium price worth it. If you insist on paying a premium try the cask strength 12 year or 21 yr at a super premium. Readbreast is my go to whiskey and I always have each of their offerings on hand.